In recent years, Pradaxa (dabigatran etexilate mesylate) has been linked to a number of uncontrollable and even deadly bleeding events. 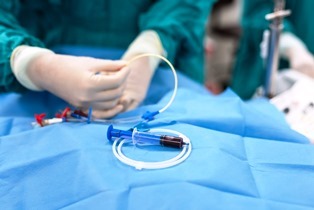 However, a March 2017 study comparing the safety and efficacy of Pradaxa and warfarin found that it may be a safer option for patients with atrial fibrillation (AFib) who are undergoing catheter ablation, a procedure that involves threading a catheter into the heart and isolating the area with the abnormal heart rhythm. The study results were presented at the American College of Cardiology 66th Annual Scientific Session in Washington, D.C. and simultaneously published in the New England Journal of Medicine. The researchers followed 635 patients currently undergoing catheter ablation for the treatment of paroxysmal or persistent AFib. Although catheter ablation is a routine procedure, it’s been linked to an increased risk of both blood clots and bleeding, making prevention of these complications a precarious balancing act for both patients and doctors. Among the study participants, those treated with uninterrupted Pradaxa had a significantly reduced risk of both major bleeding and thromboembolic events, compared to those treated with uninterrupted warfarin. Of the 317 patients treated with Pradaxa, only five experienced major bleeding, compared to 22 of the 318 patients taking warfarin: an absolute risk reduction of 5.3 percent and a relative risk reduction of 77.2 percent. Additionally, none of the patients receiving Pradaxa had serious clotting problems, compared to one patient treated with warfarin. Pradaxa’s manufacturer, Boehringer Ingelheim Pharmaceuticals, Inc., hopes the study will provide valuable insight for doctors treating AFib patients with catheter ablation. Approved by the U.S. Food and Drug Administration (FDA) in 2010, Pradaxa is a blood-thinning medication used to prevent blood clots in patients with non-valvular AFib. The drug is a member of a class of next-generation anticoagulants known as direct thrombin inhibitors. Pradaxa is one of the most prescribed drugs in its class, with millions of Americans filling prescriptions for the medication each year. Pradaxa and other direct thrombin inhibitor anticoagulants were developed as alternatives to warfarin and, while both Pradaxa and warfarin are tasked with preventing blood clots, the two drugs couldn’t be more different. One of the biggest differences between the two drugs is the mechanism of action: while Pradaxa inhibits thrombin, an enzyme essential to the clotting process, warfarin inhibits vitamin K to achieve the same goal. Most patients who choose direct thrombin inhibitor anticoagulants such as Pradaxa over the more traditional warfarin do so for the convenience that these next-generation drugs provide. Whereas warfarin patients are required to undergo regular blood tests and other monitoring, as well as dosage adjustments, to ensure the drug is working as intended, Pradaxa is usually administered in a one-size-fits-all dosage and requires no routine monitoring. The most significant side effect or complication associated with Pradaxa is an increased risk of major bleeding events. Although most anticoagulants carry a risk of bleeding, the bleeding risks associated with Pradaxa were particularly worrisome, as there was no FDA-approved reversal agent available until the FDA fast-tracked approval for Praxbind® in 2015—a full five years after approving Pradaxa. As a result, a number of Pradaxa patients experienced uncontrollable bleeding events that led to hospitalization and even death. Now, Boehringer Ingelheim Pharmaceuticals, Inc. faces thousands of dangerous drug lawsuits from former patients, as well as wrongful death lawsuits from the families of patients who died while taking Pradaxa, who claim the company failed to thoroughly research the drug before its release and failed to warn patients and doctors of the risks associated with its use. Are You Considering a Pradaxa Bleeding Lawsuit? If you experienced a life-threatening Pradaxa bleeding event, or lost a loved one due to uncontrollable bleeding associated with the drug, you may be able to seek compensation from the drug’s manufacturer. The seasoned legal team with McGartland Law can review the facts of your case and help you explore your legal options. Contact McGartland Law today to make an appointment for a no-cost, no-obligation initial consultation.